This paper presents a novel mathematical framework for representing uncertainty in large deformation diffeomorphic image registration. The Bayesian posterior distribution over the deformations aligning a moving and a fixed image is approximated via a variational formulation. A stochastic differential equation (SDE) modeling the deformations as the evolution of a time-varying velocity field leads to a prior density over deformations in the form of a Gaussian process. This permits estimating the full posterior distribution in order to represent uncertainty, in contrast to methods in which the posterior is approximated via Monte Carlo sampling or maximized in maximum a-posteriori (MAP) estimation. 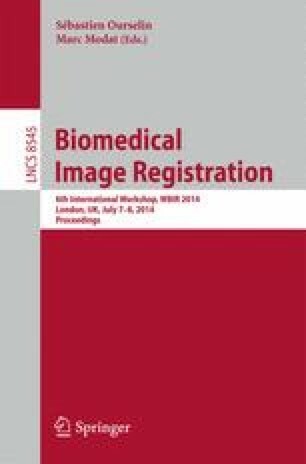 The framework is demonstrated in the case of landmark-based image registration, including simulated data and annotated pre and intra-operative 3D images. This work was supported by grants NIH P41EB015898, R01CA138419 and NSF EECS-1148870.